Only hoping that someone would give him a word of concern, and feed him some hot soup. Taiwan’s elderly now exceed 10% of the total population. One out of ten elderly people face the issue of living alone. Additionally, with the extension of the average lifespan, many of the physically and mentally disabled are now aged as well. There is an increasing significant aging of both the caregivers and the disabled. 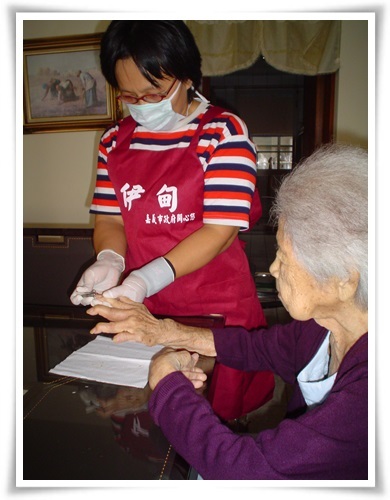 Faced with such desperate demands, the Eden Social Welfare Foundation established the “Evergreen Home” in 1997, and began to providing living and home care services in 1998 for the elderly. Having someone to take care of us during old age is the wish of everyone. The Eden Social Welfare Foundation hopes to remove the fear of the elderly that they would have no one to rely upon, and delivers warmth to more old people. Based on the concept of holistic care, people who receive services from the Foundation not only include the severely disabled and those with chronic diseases, but also the elderly. The Foundation attempts to strengthen the scope of its services and expand its service areas, find potential manpower and material resources, and integrate the resources for the best use. The Foundation has strived to manage its community service stations, and provide care for the community, allowing the elderly to have a place for mutual learning and exchange. For the elderly who cannot live independently, we provide day care services and home visits, working together with the elderly so that they can spend their last years with quality and dignity. Grandma Wang did not even have the strength left to cater to her basic needs and could only crawl on the floor of her house when social workers from Eden found her. It wasn’t until Eden’s workers’ got involved that she was able to live in a clean environment and have hot meals. The workers even gave her a new hair cut and were able to take her outdoors to enjoy the sun.